Rossi Rifleman • View topic - Is there a left and right to the barrel band? Is there a left and right to the barrel band? From the factory, my R92-57001 has the flat-head screw facing the right-hand side of the rifle. Must it? Can it be rotated to where the screw is on the left? Re: Is there a left and right to the barrel band? As far as I know, there's no reason why it shouldn't work. The fit might be a little tight if there are small areas of the band that aren't quite symmetrical. Give it a try & see if it'll work. I'm pretty sure it has a taper to it that makes it one way only. Sorry, I didn't bring mine to work. Yes, the band can be rotated so that the screw goes in from left to right. That is how I have oriented all my bands, both 92 and Rio Rio Grande. I have removed every band and hand fitted it to forearm and barrel. Every one of the nine rifles needed work. I was able to "flip" my band over so that the screw goes in from right to left. I arranged it this way so that I can solder a sling bar on it left side of the band. Okay, now I'm going to go turn mine around, just so I can fit in. 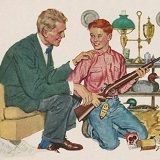 I do recall that I took a file to mine to ensure no contact with the barrel. HarryAlonzo wrote: .... Sorry, I didn't bring mine to work. HarryAlonzo wrote: I do recall that I took a file to mine to ensure no contact with the barrel. That's an interesting point... Did you do that to keep the metal bits from wearing against each other, or for accuracy? If for accuracy, did you notice a difference before & after? I did it for accuracy, although I did not perform any sort of before-and-after testing. It was an attempt to free float the barrel, although this is impossible to do completely. 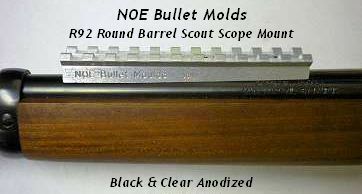 The barrel is tied to the magazine tube with the forward barrel band, and the fore end is a mighty close fit, even with sanding. The theory is that you don't want to constrain the natural vibration of the barrel, particularly with the fore end. That's because you're not always going to support the fore end the same way (bench rest, off-hand, field rest of opportunity).